Which Came First: The SCOBY or the Kombucha? Which Came First: The SCOBY or the Kombucha? Which Came First: The SCOBY or the Kombucha? It was a hot summer day thousands of years ago when an exhausted Chinese housewife sat down for a moment to catch her breath and enjoy a cup of hot tea after sending her children outside to play. After only a few small sips, she heard yelling and crying outside. Sighing, she set her tea cup on top of a cupboard and stepped outside to see her son repeatedly poking his little sister. Then the two began shoving and pushing each other, getting dirt all over their clothes, and just like that, mom’s tea break came to an end. Weeks later she found the cup of tea and saw that something thick and slimy was covering the top. Ugh! She lifted it up, sniffed it. Not bad – a little sour, a little fruity. There was still some tea under this strange mass, and for some reason, she was compelled to take a sip and – it was delicious! Slightly sweet, tangy, and with a little bit of a tingle. She brewed up a big batch of tea, poured it into a big jug, and dropped the “tea mushroom” on top. She covered it with a cloth and placed the jug on the cupboard. And lo and behold, kombucha was born. At long last, the question has been answered: the SCOBY came first. That acronym, SCOBY, stands for “symbiotic culture of bacteria and yeast.” Mmmm, mmmm, mmmm, doesn’t that set your stomach a-grumblin’? Kombucha is the name of the drink that is produced using this culture. It’s a fermented beverage that is contains a small amount of alcohol. I made my first batch of kombucha several years ago in a flurry of wanting to make everything from scratch. That didn’t last long, but my habit of making kombucha did. I’d be a monkey’s uncle if anyone in my neck of the woods had a SCOBY to give to me, so I had to buy one. Once you get one, you pretty much have one (plus son of SCOBY, grandson of SCOBY, great-grandson of SCOBY – you get the idea) forever, unless you leave it too long in the refrigerator or it gets too hot. I’ve purchased SCOBYs from Kombucha Brooklyn and Oregon Kombucha. I’ve been happy with both companies. You can get complete starter kits (including tea bags) or just the SCOBY – but you’ll always get detailed instructions on how to brew your beverage. Alternatively, if you know someone who brews their own, they undoubtedly will have many, many “mothers” hanging around in their refrigerators. Ask them if you can have one – along with about 1 cup of kombucha. I’ve seen SCOBYs for sale (or even free) on craigslist, but, I don’t know. That kind of creeps me out. You have to have real trust in a person to take one of their SCOBYs – it’s kind of like sharing a toothbrush. Warning: SCOBYs are…unattractive. And slimy. But I feel a certain tenderness towards them, like a mother (see what I did there?) has for her homely child. Make sure you use some black tea in your mix. SCOBY likes black tea. I use more black tea than herbal tea (which I use for flavor) always; when I’ve messed around and used more herbal tea, my kombuchas haven’t brewed as well. Snip the strings off of the teabags. This way they don’t get caught on the handle of the spoon when you stir the tea. Do not use a wooden spoon: they harbor germs, ewww! I use a very humble black tea: Walmart brand decaf black. If you’re a Walmart snob, get over it. I had to because it’s the only game in town. (You haven’t lived unless you’ve eaten their Roasted Tomato Chipotle Roja Salsa. I’m not kidding.) I have also used Tazo Awake black tea with good results. Don’t skimp on the sugar. I’ve got my issues with cane sugar, but I always put in a full cup of the stuff in each brew. SCOBY needs sugar to do its thing. You need your three squares a day, don’t you?? I started out using canning jars to store my brewed kombucha, but after a while I got all fancy and ordered up a big batch of tall bottles. I’m really pleased with how well they work – and they look very nice, too. Fill your big jar with hot tap water and let it sit while you boil the 14 cups of water. I do this because I think it will prevent the big jar from shattering when I pour in the boiling water. Who knows. It’s a ritual, okay? Since I boil the water in my electric tea kettle, I have to do this part in two batches. When the water has come to a boil, pour the tap water out of the big jar, add the sugar and pour in the boiling water, stirring to dissolve the sugar completely. Now add the tea bags. If you’ve had to do a second batch of boiling water, add it to the jar. Stir gently. Let the jar sit on the counter for several hours until just warm. If you add the SCOBY right away, you’ll kill the poor thing. Once the water has cooled enough, remove the teabags and add the SCOBY along with the one cup of reserved kombucha. Cover the jar with the cloth and put the rubber band around the top of the jar. You want to keep out the fruit flies because fruit flies love kombucha like Lindsay Lohan loves vodka. Put the jar in a warm place; I use the top of my refrigerator. Brewing times depend on the temperature of the room the kombucha is in. In the winter it takes much longer for my brew to reach the desired flavor, while in summer, it’s possible to have kombucha in a week. Periodically taste your brew – using a clean metal spoon. It’s done when it tastes good to you. It should have a slightly sour, tingly taste. If it’s very sweet, than SCOBY hasn’t snarfed up all of the sugar yet. I’ve noticed that my “mother” eventually floats to the top of the jar and forms a kind of seal. I take this as a sign that all is well. Once satisfied with the taste, it’s time to bottle your brew. As I mentioned above, I use generously-sized bottles with flip tops, but mason jars work just fine. When I first began bottling my kombucha, I strained the liquid through a coffee filter – – what a monstrous waste of time (not to mention messy). Forget that. I use a funnel to get the liquid more or less cleanly into the bottles and I don’t mind the little bits of primordial ooze floating around. The kombucha will have a slight bubbly quality to it – but batches vary. Sometimes you get a lot of fizz and sometimes very little. After pouring your brew into bottles, you want to close the jars and let them sit at room temperature for a few days. The kombucha will continue to ferment and, if you’re really lucky, will develop even more fizziness. How long you let it sit before storing it in the refrigerator is a matter of personal taste. It will take a few batches for you to get a feel for it. The kombucha is now ready for its home in your refrigerator. Once cold, it makes a fantastic treat on a hot summer day. I started a journal with my very first kombucha, not only because I thoroughly enjoy making lists and using my ruler to make straight lines, but because it helps me figure out what flavors work together and which don’t, and I can keep an eye on average brewing lengths over the seasons. I make notes about how each brew tastes, when I started it, when I bottled it, when I put the bottles in the refrigerator, and so on. Completely optional, but helpful if you think you might brew regularly. Make sure that the big jar, bottles, spoon, and especially your hands are clean. I’m from an era when eating dirt was today’s equivalent of speed-loading antioxidants. I credit my childhood dust, dirt, and germ consumption with the low number of colds I’ve had in my lifetime. So, I’m probably a little bit lax in this area when it comes to handling kombucha. A biohazard suit is not necessary. In other words, I don’t go full Howard Hughes on it – but I do make sure my hands are washed and all of the jars/bottles/utensils are clean. DO NOT drink your kombucha if it smells bad, “off,” or just plain rotten. It should have a sour, slightly vinegary smell – it’s a clean smell and you’ll know immediately if you have a bad batch. DUMP IT and start over. It’s not worth a trip to the hospital. If you see mold on the top – your batch has gone seriously south. The SCOBY that develops should be pale-colored, smooth and shiny, not green and fuzzy. I’ve made more batches of kombucha than I can count (actually, I could count them thanks to my journal, but I’m too lazy) and I’ve only had 2 batches that I’ve tossed out, and not because they’d “gone bad.” I’d let them ferment too long and by the time I got to them, they tasted like vinegar that had been distilled through dirty socks. Kombucha followers attest to the many benefits derived from drinking daily glasses of kombucha – everything from improving digestion, liver detoxification, clearer skin, and suddenly being able to sing in perfect pitch; I can’t say that I’ve experienced anything earth shattering, but then I don’t drink it every day. A quick internet search will yield way more information about this than you’d be able to read in a lifetime. I drink it cuz it tastes good. Thanks, hon! Probably a bit long, but…it’s a process. Oh fun! I really enjoy making it. Definitely update me after your first batch! This is all new to me. I never heard of anything like this before. Thanks for this lovely post & I learned a few new things too! I can totally envision you making your own kombucha, Sophie! I think you’d really like it. This is great! I love your story of the beginning of kombucha. I’ve brewed my own a few times but always forget to start a new batch. It took me a while to get into the rhythm. I’d drink what I had and then – oops – forgot to start a new batch! I’m excited to try this! Where did you get your cute bottles? MUST bookmark this. I have been dying to make my own kombucha for too long now! You gotta do it! Although you have a slug phobia, don’t you…? Um, may I ask what a slug phobia has to do with kombucha? I’d love to make my own, have wanted to for a while, and your post set the wheels turning again. BUT, I am terrified of snails/slugs. Cuz the SCOBY kinda resembles a slug…a little slimy. But I don’t think it leaves a trail ;-). I KNOW you can handle it! Annie Fantastic! I have always wanted to attempt my own kombucha — my fave digestive aid of all! You’ve set the wheels in motion here… 🙂 And great history too! It’s so fun. And of course, yummy :-)! Thanks – a little fun with SCOBY ;-)! This is so cool, especially the Walmart part! HeeHee… I used to make Rejuvelac weekly and I did get used to the taste, but not because it tasted good. This sounds much more enjoyable. In fact, yesterday I was working on my first batch of Crystalized Ginger and was thrilled to find out that the water left behind after cooking the fresh ginger makes a fabulous tea. I know you said that you prefer the black but I’m not into that so I think I’ll try it with this ginger stuff first. It has quite a hot bite so it may be more flavorful that herbals, will let you know. Now how much should I spend for the Scoby, about? Big difference in taste between rejuvelac and kombucha. Sadly, I’ve had terrible luck with rejuvelac – not giving up, though :-). You can get a SCOBY, sugar, and tea for about $16 at Oregon Kombucha. A full kit might set you back between $45-$75 depending on how fancy you go. My guess is you’ve got most everything needed, so probably going with the basic SCOBY will work fine for you. I wish I could send you one! If it were winter, I think it would make it (Oregon Kombucha shipped me one without dry ice during late winter). Gosh, I would think so! Maybe we should just start by giving ALL politicians the boot! Start fresh! Sounds good except they’d all get their 99 weeks if we fired ‘um. You are such an artisan! Taking matters to your own hands. Thanks for sharing your recipe and tips. I gotta say Kombucha was an acquired taste, now I can’t get enough of it! My fave is the Synergy brand Grape flavor with chia seeds. Perhaps I should also start making my own. I agree – one does have to make an effort with kombucha, but once you like it – nothing else will do! Grape sounds yummy! Haha! One either loves the stuff or avoids it like the plague! You’ll really enjoy making your own, I’m sure! And everyone can use more friends! great post! I’ve been making my own kombucha for a few years now and it’s good to see all the information organized in one place for people who ask me how to get started. Where did you get those lovely bottles in the photo? I reuse bottles from the store but the lids aren’t great – they either break or they are impossible to open or they let all the fizz out. I’ve never even heard of kombucha, this is a revelation to me. I see you as an alchemist with all your bottles and potions, brewing up curious and wonderful things in your kitchen. Hehe – sometimes it IS like that in my kitchen! I like you too much not to forgive you for this minor transgression! For some reason I can’t reply to the thread I was on above…I will definitely try making kombucha this fall/winter, just gotta get through Vegan MoFo first! Thanks Annie. What can I use if I don’t have kombucha to make kombucha? Ida, do you have a SCOBY? Or are you really, really starting from scratch? Love your tips and humour here! I love kombucha but it really is a hard sell if you’re just explaining it. I started making kombucha a few months ago, but but completely stopped as soon as the end of school program madness hit. I definitely need to start again! Green tea also works well, instead of black tea. I’ve tried both, with and without other flavours and I prefer the green tea. I think there just needs to be caffeine for it to work, though I’ve no idea why. 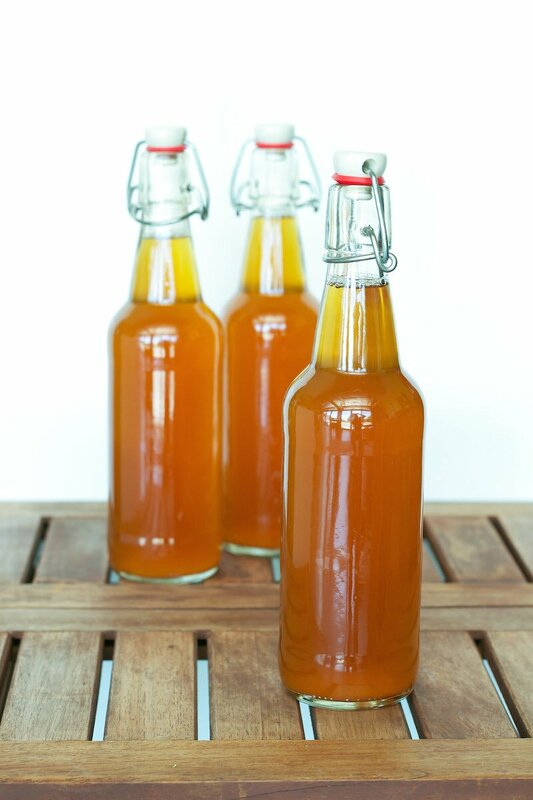 Have you tried adding extra flavouring to your kombucha for the 2nd ferment (when you put it in the bottles and close)? I’ve tried blueberries, raspberries, ginger, and fresh lemon juice so far. Blueberry was my favourite so far, ½ for the taste, and ½ for the gorgeous colour. I haven’t tried green tea, but I’ve messed with the caffeinated + herbal ratio and the brews with more caffeine definitely work better. I also kind of come and go with brewing. In the winter I don’t do it too much, but am pretty steady in the spring and summer with a big bottle of it always fermenting. I will definitely try flavoring! Do you put fresh fruit in or juice? I’ve just used fresh berries, fresh ginger, and fresh lemon juice, but I’ve seen others use a little bit of juice. I’ve never really planned the flavourings, just used a little bit of something I had on hand. I just had my first glass of kombucha last week! A friend invited me over for lunch and had some brewing in her kitchen–YUM. She offered me some SCOBY once I’m ready to start brewing. Can’t wait to get started, your guide is great! Cool! Yeah, I love it even if it is a bit funky. Let me know how your brewing goes! Just started bottling my first batch! It turned out great–fizzy with a nice tartness. I ran out of bottles, gotta get more tomorrow. Thanks for the recipe! Pingback: Adventures in Natto: What is Natto? So i can make a scoby from black tea and sugar. Thats how the first one was made, right. Tom, I started with a purchased SCOBY and have never “made” my own (other than the subsequent SCOBYs). Your article and it was a good refresher for the other articles I’ve read about Kombucha. Your observations and suggestions are especially appreciated and very useful.